Action can either be direct or indirect based on the specific needs of the community and partnership. Standing up for others. Giving voice. This component focuses on an explicit teaching of the meaning of advocacy and its different forms and forums. Advocacy is about making a difference through political and/or public education. RMC Research Corporation. (2007). 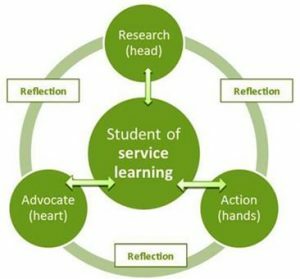 Reflection in K-12 Service-Learning. Scotts Valley, CA: National Service-Learning Clearinghouse.